We’ve been visiting our local libraries a lot. It’s free, it’s nearby our home, and we’re all bookworms in our family. Even though we try to go a few times a week we still end up coming home with 2 or 3 bags full of books. We LOVE getting out and having a library just a few blocks away- within walking distance- from our apartment is awesome! Plus, getting to the library completely takes my mind off the fact that I have just moved. I am still in shock from it all. It happened so quickly. I like that of the 2 libraries closest to us, we have 2 storytimes a week for Z’s age (4 and under) and one for Ny’s age, an after-school school story activity hour. This gives us something to look forward to each week. I’m sure we’ll join more or our local activities for kids and homeschoolers soon, but for now we’re just doing good to situate our belongings and furniture and find our way around town! 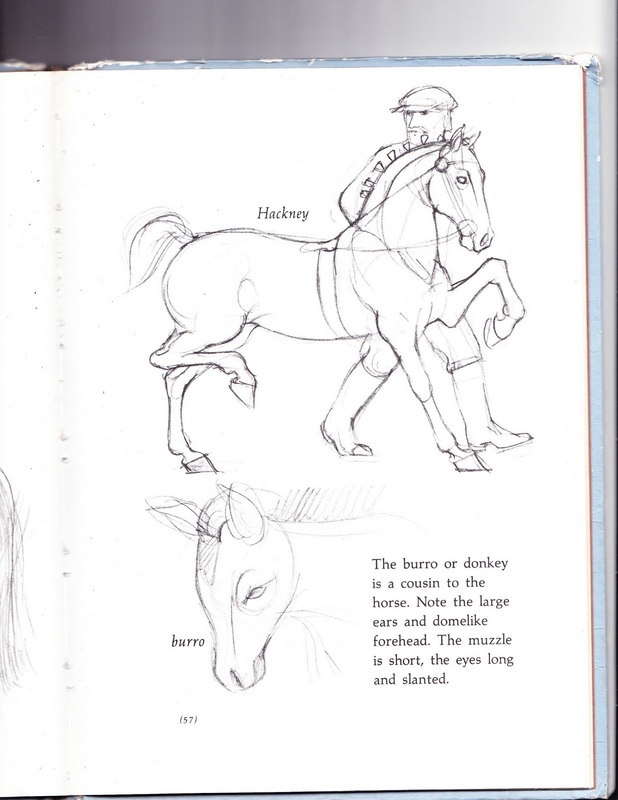 So, yesterday Ny wanted a book about how to draw horses. She’s been really getting in to drawing a lot more lately, especially horses- her favorite thing to draw. 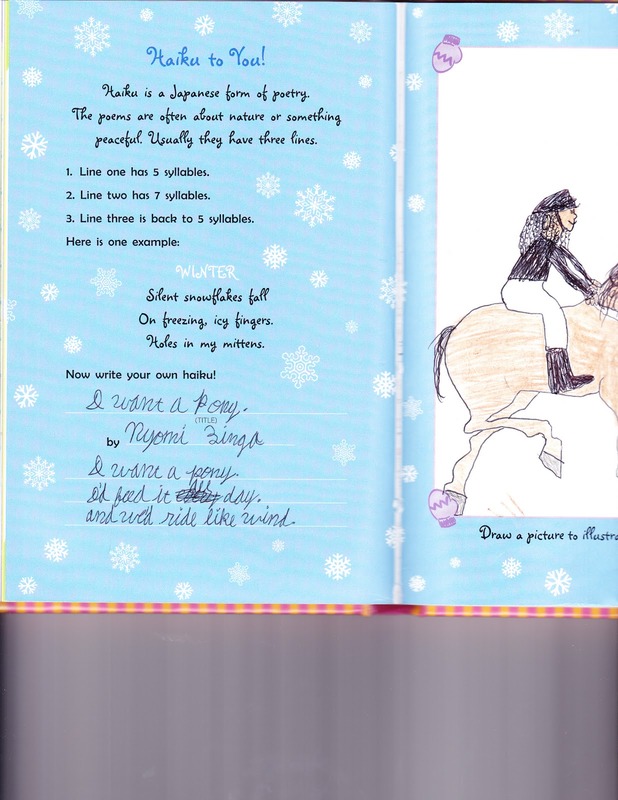 We brought home some horse books, along with a book called “Hip Hop Speaks to Children- a celebration of poetry with a beat“. I actually enjoyed the book just for me! Ha. But I used it as a starting point for a lesson on writing poetry. 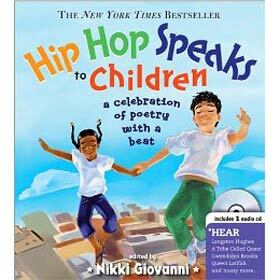 The poetry is urban, some free form, all encouraging messages and thoughts, and helps children to learn (through example) how to express themselves through rhyme and beat. I listened to this with both girls and asked Ny to take anything that inspires her as a springboard to write her own poem. I sent her to her room with pencil and paper and nothing more. She was to come out with a poem. About an hour later she emerges from her room in deep thought then returns to her room for more writing. Then she comes bounding out of her room again- this time with a haiku (of all poems!) AND an illustration. Tell me I wasn’t proud! She later realized the second line only had 5 syllables, and not 7…so she changed it to “I would feed it every day”. Now, here is Ny’s version of it (no tracing, only drawing- and she’s drawn herself riding the horse). 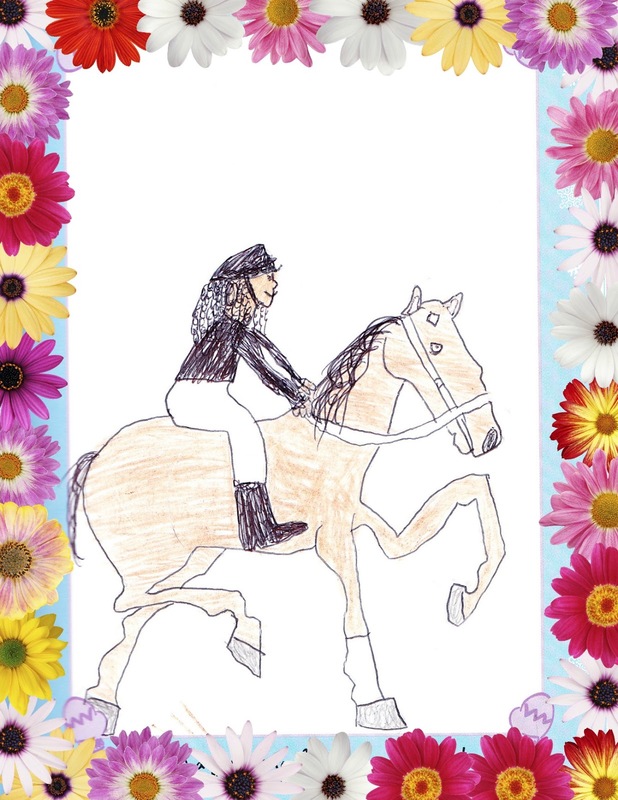 I think she has a good eye for art…so we’ll be looking for art activities around town for her to participate in.